Things will be hotting up in St Helens this weekend when a chilli festival and an antiques and collectors fair make their debut appearance in the town centre. This Saturday (24 September), St Helens Council and Chilli Fest UK presents the first St Helens Chilli Village Fiesta in Church Square, where a variety of chilli producers from around the country will exhibit their chilli products. 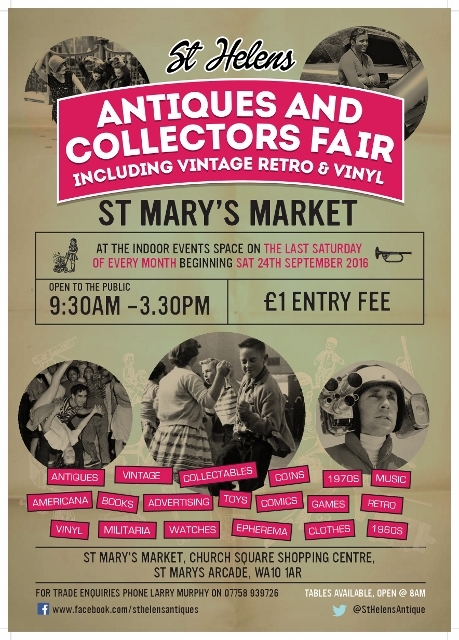 Meanwhile in St Mary’s Market that day, take a trip down memory lane and enjoy a day of nostalgia at the launch of a monthly antiques and collectors fair. Taking place at the back of the market by the events space on the last Saturday of every month, stalls include vintage and retro items from yesteryear, including toys, comics, vinyl records, clothing, Americana, and much, much more. St Helens Town Centre Manager, Gary Maddock said: “I’m delighted that we are able to bring high quality events like this to St Helens. Working in partnership with the private sector is critical to the development of the town centre and borough. Chilli Village Fiesta 2016 will take place in Church Square from 10:30am to 5:30pm and is free to attend. The St Helens Antiques and Collectors Fair is open to the public from 9:30am- 3:30pm with a £1 admission fee. For trade enquires, call Larry Murphy on 07758939726.